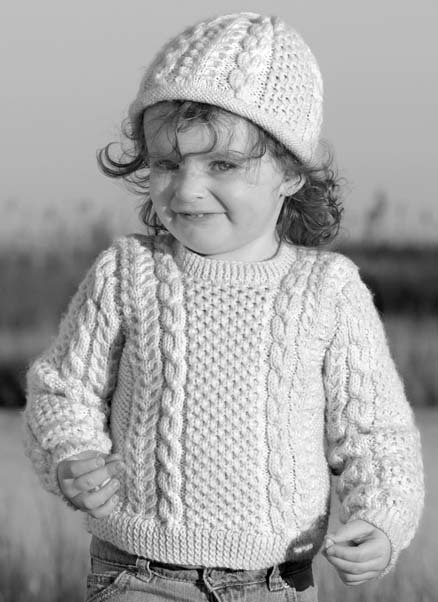 Years ago mothers and grandmothers asked me for a lightweight Aran design for babies and toddlers. These requests inspired Christina. Panels of Wave of Honey, Double Ring, Gordian Knot and Seed Stitch, which are a few of the easier Aran patterns, make Christina & Cap a relatively quick knit on #6 needles. Aran designs are best suited for intermediate and, of course, advanced needle workers. To celebrate its sixth printing, I created a cap for Christina – featuring a roll brim with the Aran patterns around the crown of the cap. Aran patterns have more depth and greater stitch definition when they are knit with smooth evenly spun yarns, the spinning method is called worsted spun. Superwash wools take comfort a step further for younger children because this process, which originated in Europe, produces whisper-soft, non-allergic wool, which is also machine-washable. Cap Sizes Small & Large.